While its homes may not generally be as grand as those of Pacific and Presidio Height or St. Francis Woods, no neighborhood in the city comes close to matching the number of $2 – $4 million sales that occur in Noe Valley and its environs. 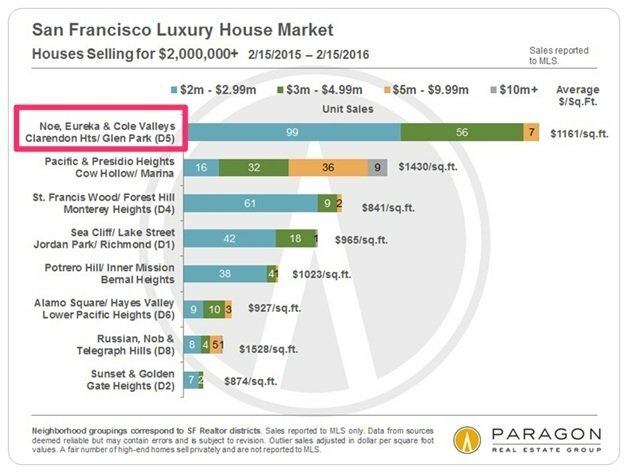 Admittedly, part of the reason is that the Noe Valley and surrounds is large geographically compared to those other neighborhoods, so you’d expect there simply to be more sales. 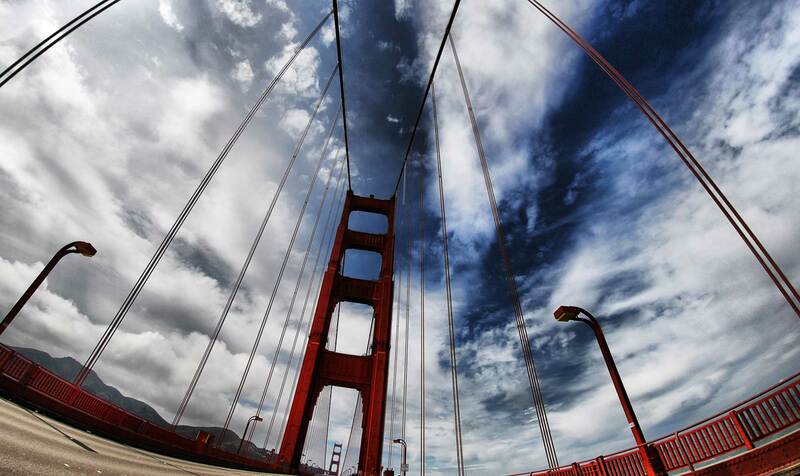 But, as any one who has tried to buy a home in Noe Valley will tell you, homes here are expensive – period. As a long-time resident here, I can tell you that Noe’s attractions are many. They include its bustling commercial center on 24th Street, complete with a small Whole Foods; easy access to I-280 for the Silicon Valley commute (for those not taking a Goo-hoo bus); decent weather; views from the hills; a good elementary school (Alvarado); and a family-friendly vibe. 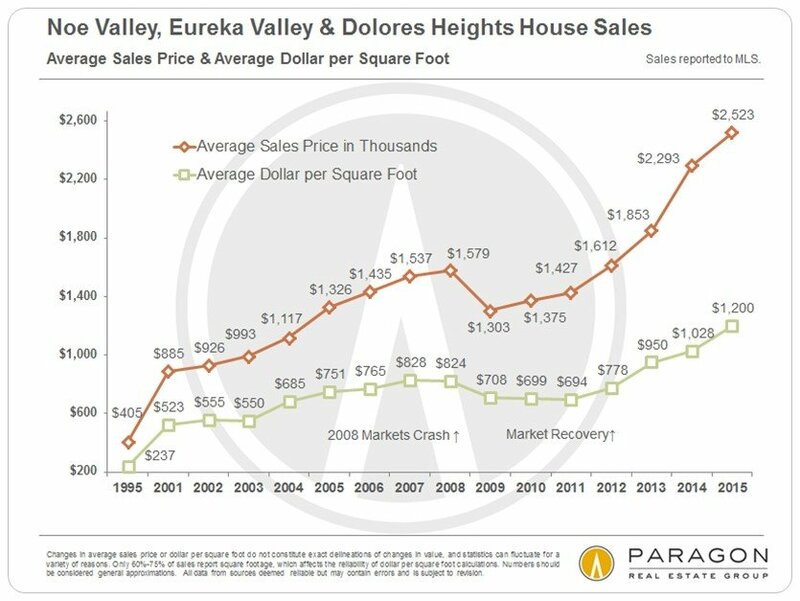 While Noe Valley was not immune from the sell-off that followed the housing market collapse of 2007/2008, prices have now far eclipsed their pre-crash high. The average price of a single family home hit $2.5 million in 2015. No wonder home buyers are bidding up prices in other more affordable neighborhoods nearby, like Glen Park, Sunnyside and Miraloma Park. And while there may be some flattening of year over year price increases occurring, it is certainly not a clear trend as yet. 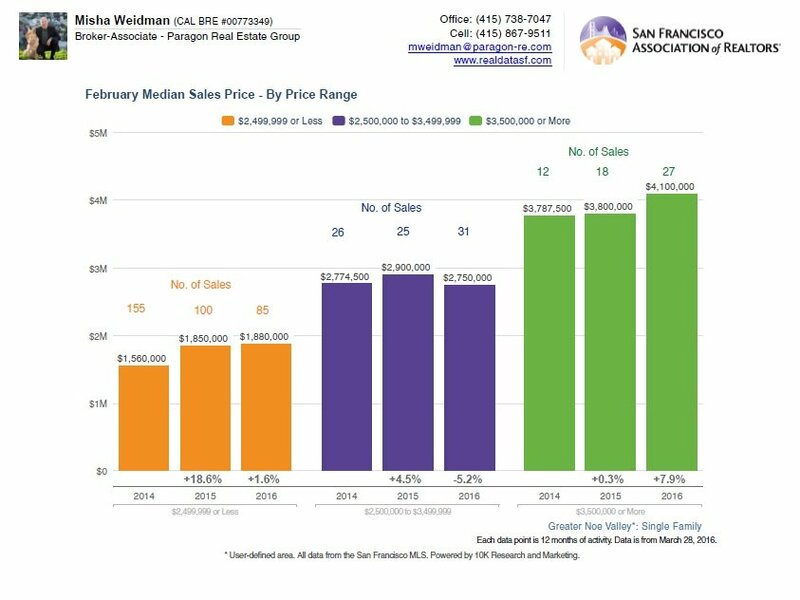 I divided Noe Valley and surrounds into three price tiers: those that sold for less than the overall $2.5 million average; those that sold for between $2.5 and $3.5 million; and those that sold for more than $3.5 million. The following chart shows year over year price changes based on 12 months of data ending in February of the last three years. I’ve also included the number of sales for each tier. As you can see, while there appears to be some slowdown in the lower and middle tiers over the last 12 months compared to the 12 months ending in February 2015, the most expensive tier did very well. It will be interesting to see how prices shape up as the seasonal Spring buying and selling season heats up. As always, your questions comments and referrals are very much appreciated it!